The Catholic Church in Ethiopia held a Mass this morning for the 30 Ethiopian migrants killed by Islamic militants in Libya. The country’s bishops had earlier strongly condemned the killings, saying that they’re saddened to hear that they were killed for refusing to change their faith. The bishops called on the young Ethiopians to explore all the available opportunities of development in their own country, before deciding to take on migration as an option for a better life abroad. “We ask the youth to consider the option of working and prospering in your own country and abandon the idea of migrating to another country where there is no safety,” said the bishops. “We ask you not to travel without making sure that your country of destination provides you the necessary protection or fall in the traps of the human traffickers and travel without the necessary legal documents,” they said. The bishops pleaded with human traffickers to stop their acts of putting young people’s lives in danger by smuggling the youth to boarders of another countries where their rights are not respected. Similarly the Ethiopian Inter-religious council of Ethiopia in a joint statement from all its member religious denominations condemned the atrocious acts of killing innocent young Ethiopians. 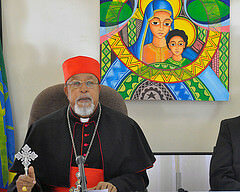 Cardinal Berhaneyesus, Arcbishop of Addis Ababa said that the departed children of Ethiopia will be remembered always as martyrs. The Patriarch of the Ethiopian Orthodox Tewahedo Church His Holiness Patriarch Matthias said we should all unanimously condemn this terrorist act. The President of the Ethiopian Islamic Supreme Council Sheik Mohammed Amin that said such act goes against the teaching of Islam. “The Holy Quran instructs us to respect and protect human life, moreover, the Prophet Mohamed has said we should respect Ethiopia for the great favor she did to his the first followers, he did not say Muslims, Christians, white or black. What was done to young Christian Ethiopians in Libya was against that” said the imam. The Ethiopian Peoples’ Representative Council has declared a 3 days national mourning period from April 22 – 24, 2015. On April 22 a Mass rally was organised in Addis Ababa where residents of the city in their thousands raised their voice against the killings of Ethiopian Migrants.